مزرعه فراهانی, مجید, جعفریانی, مینا. (1391). تغییرشکل‌‌ کلی و تغییرات زمانی و مکانی آن در سامانه‌‌های جوّی بارش‌زا در منطقه‌ای شامل ایران. 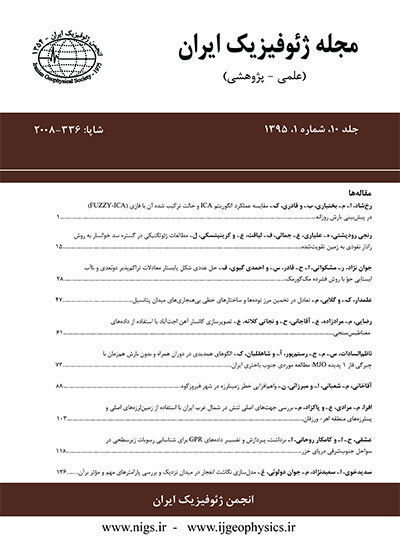 مجله ژئوفیزیک ایران, 6(2), 141-156. مجید مزرعه فراهانی; مینا جعفریانی. "تغییرشکل‌‌ کلی و تغییرات زمانی و مکانی آن در سامانه‌‌های جوّی بارش‌زا در منطقه‌ای شامل ایران". مجله ژئوفیزیک ایران, 6, 2, 1391, 141-156. مزرعه فراهانی, مجید, جعفریانی, مینا. (1391). 'تغییرشکل‌‌ کلی و تغییرات زمانی و مکانی آن در سامانه‌‌های جوّی بارش‌زا در منطقه‌ای شامل ایران', مجله ژئوفیزیک ایران, 6(2), pp. 141-156. مزرعه فراهانی, مجید, جعفریانی, مینا. تغییرشکل‌‌ کلی و تغییرات زمانی و مکانی آن در سامانه‌‌های جوّی بارش‌زا در منطقه‌ای شامل ایران. مجله ژئوفیزیک ایران, 1391; 6(2): 141-156. در بررسی رخداد بارندگی، معمولا به دو کمیت دینامیکی واگرایی و تاوایی و نیز متغیرهای وابسته به‌‌این دو بخصوص تاوایی پتانسیلی توجه زیادی شده است اما به نقش متغیر محاسباتی تغییرشکل‌‌، خصوصاً تغییرشکل کلی- به‌‌جز موارد معدودی در تحقیقات مربوط به جبهه‌زایی - کمتر توجه شده است. این پژوهش در پی آن است که تغییرات‌‌این متغیر را به‌‌طورکلی و کمیت‌‌های تغییرشکل‌‌ کششی، و تغییرشکل‌‌ چینشی در سامانه‌‌های همراه با بارش در منطقه شامل‌‌ایران را مورد تحقیق و بررسی قرار دهد. برای این کار با استفاده از داده‌‌های(Global Forecasting System) GFS مؤلفه‌‌های باد طی پنج سال، مقادیر تغییرشکل‌‌ کششی، تغییرشکل‌‌ چینشی و تغییرشکل‌‌ کلی، در نقاط شبکه‌‌ای که ناحیة مورد بررسی را پوشش می‌‌دهد، محاسبه شد. همچنین داده‌‌های نامنظم بارش اندازه گرفته شده در ایستگاه‌‌های سینوپتیک کشور با روش تحلیل عینی کرسمن به نقاط منظم شبکه منتقل شد. مقایسه الگوهای مقادیر تحلیل شدة بارش با الگوهای مقادیر تغییرشکل‌‌ کششی، تغییرشکل‌‌ چینشی و تغییرشکل‌‌ کلی در شش، دوازده و هیجده ساعت قبل از وقوع بارش، نشان داد که در منطقه مورد بررسی، مقادیر 6 ساعت قبل کمیت محاسباتی δ که برابر با حاصل‌ضرب اندازه تغییرشکل‌‌ کلی در تندی باد تعریف می‌‌شود، در اکثر موارد منجر به وقوع بارش در منطقه، دارای مقادیر فرین می‌‌شود. مقدار بیشینه δ برای مقادیر متفاوت بارش به صورت پله‌‌ای محاسبه شد. نتایج نشان می‌‌دهد که بیشینه δ برای همة مقادیر بازه پله‌‌ای بارش در یک بازه مشخص قرار دارد. همچنین راستای غالب محور کشیدگی تغییرشکل‌‌ کلی در هنگام وقوع بارش، در ناحیة مورد بررسی ترسیم شد و مشخص شد که محور کشیدگی تغییرشکل‌‌ کلی اکثراً در راستاهای غربی- شرقی، جنوب غربی- شمال شرقی و شمالی- جنوبی قرار دارد. Divergence and vorticity are two most attractive and popular quantities in the study of sever atmospheric phenomena. On the other side, the role of deformation, especially total deformation – expect for a few cases related to the frontogenesis theory – has received less attention of scientists. This study is trying to fill this gap a little. It is trying to examine the role of deformation in general and the stretching deformation, shearing deformation and total deformation in particular on precipitation. In doing so, the GFS (the Global Forecast System) wind components data in five years (2003-2005) were used to compute the stretching deformation, shearing deformation and total deformation in a network covering the Iranian and influential surrounding area. In order to evaluate the effect of the deformation field on the atmospheric variable here we used the collective 24 hours precipitation reported by the synoptic observatory around the concerned domain. Due to the irregularity of the observatories in the beginning, the reported data of the rainfall from synoptic stations were moved to regular grid points applying Cressman objective analysis method. The distribution maps of precipitation and contours of stretching deformation, shearing deformation and total deformation also were prepared. Comparison of the precipitation maps and the maps of stretching deformation, shearing deformation and total deformation in six, twelve and eighteen hours before the occurrence of precipitation, showed that in the concerned region the flux of total deformation pattern (dot product of the total deformation and the wind) was more consistent with the precipitation maps in 6 hours later. Therefore, the flux of the total deformation has a predictive value for precipitation and could be used as a precursor of precipitation. Besides the general matching of the patterns of the total deformation flux and precipitation, the location of the maximum precipitation occurrence is reasonably compatible with the location of maximum flux of total deformation in six hours earlier. In the grid points of significant values of the precipitation, the total deformation fluxes were calculated for comparison. Also for more precise investigation, the values of the cumulative rainfall were divided into three groups (0-10), (10-20), (20-30) mm and the values of the total deformation flux were computed for each of these intervals. It has been verified that the interval of 0-10 has the maximum frequency of happening regardless of value of deformation flux magnitude. The probability that precipitation occurs between 0-10 is 26%. Also the probability of occurrence of larger deformation flux decreases exponentially as the value of deformation flux increases regardless of value of precipitation. The results of the computation show that the total deformation flux is varying between 5e-5 and 10e-5 for all intervals of the three groups of rainfall. The elongation of the dilatation axis of the total deformation for all available data was computed. Based on the results of this computation the axis of dilatation in severe rain falls are elongated in the direction of West - East, Southwest - Northeast and North – South depending on the raining area and the core of maximum precipitation. Afanasyev, Ya. D., and Peltier W. R., 2001, Numerical simulations of internal gravity wave breaking in the middle atmosphere: The influence of dispersion and three dimensionalization: :J. Atmos. Sci., 58, 132-153. Bluestein, H. B., 1977, Synoptic-scale deformation and tropical bands: J. Atmos. Sci., 34, 891–900. Cressman, G. P., 1959, An operational objective analysis system: Mon. Wea. Rev., 87, 367–374. Cunningham, P., and Keyser, D., 1999, Frontogenesis and frontal motion due to confluent deformation with a translating dilatation axis: Quart. J. Roy. Meteor. Soc., 125, 2563-2573. Gao, S., Yang, S., Xue, M., and Cui, C., 2008, Total deformation and its role in heavy precipitation events associated with deformation-dominant flow patterns: Adv. Atmos. Sci., 25, 11-23. Jaeger, E. B., and Sprenger, M., 2009, Vorticity, deformation and divergence signals associated with stratosphere-troposphere exchange: Quart. J. Roy. Meteor. Soc., 135, 1684-1696. Martin, E. J., 2006, Mid- Latitude Atmospheric Dynamic: John Wiley, 324. Murgatroyd, R. J., 1969, The dispersion of pollutants in free atmosphere by the large scale wind systems: Phil. Trans. Roy. Soc. Lond. A., 265, 273-294. Saucier,Walter J., 1953, Horizontal deformation in atmospheric motion: Trans. Amer. Geophys. Union, 34, 709-719.